This is our typical concert. The repertoire we offer includes both songs for listening and songs for dancing, in a melodic trip along the regions of southern Italy: starting off with waltzes and songs from Siciliy and Campania, we will reach Lucania and Calabria with its tarantellas, then moving to Apulia, playing serenades and pizzica pizzica, songs of love and disdain, up to Sardinia, with its songs of devotion and dance tunes. Our voices are accompanied by traditional musical instruments: piano and diatonic accordion, battente guitar, calabrian lyra, cane flues, violin, frame drums and a large quantity of minor percussions, constantly adding new tunes and instruments to our repertoire, so that every concert will be a unique experience. Our show can vary depending on the venue we play in, setting a song list that could suite more a “listening” or a “dancing” audience. The thing that will never change is our wish to share the same emotions we feel while singing and playing, moving you with slow and heartfelt pieces, as well as making you dance to the wild rhythms of pizzica pizzica and tarantella. A concert based on polyphonic songs belonging to the religious traditions of the Mediterranean area, of both cultivated and popular origins. The musical forms coming from these meetings are as well proof of all these influences and cultural exchanges which gave rise to an aesthetic culture with common features for all Mediterranean populations. 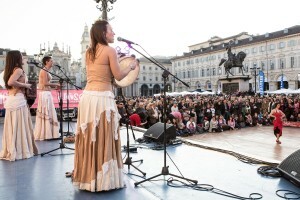 Accurate studies and researches of the traditions of Occitania and Italy, from the regions of Campania, Apulia, Calabria and the largest Mediterranean isles, Sicily and Sardinia, made us develop a concert of unique and moving songs, expressing vibrant devotion and deep spirituality through music.